With the end of parliamentary sittings I was looking forward to a day in the forests. 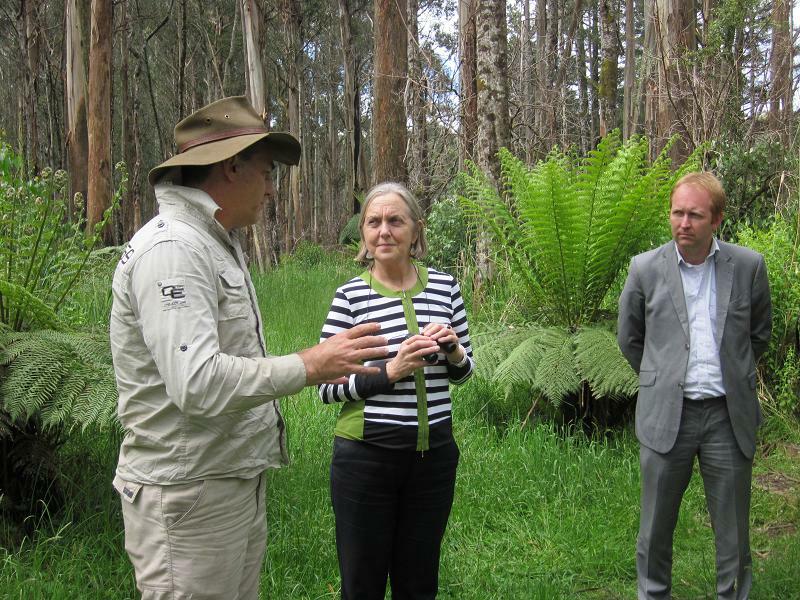 Victorian Greens MP Greg Barber and Healesville-based conservation group Myenvironment had organised an excellent program in the Central Highlands with local forest activists and scientists. I was keen to see the forest regeneration after the shocking 2009 fires and discuss tactics with Greg and locals about our campaign plans to end industrial logging of our native forests. 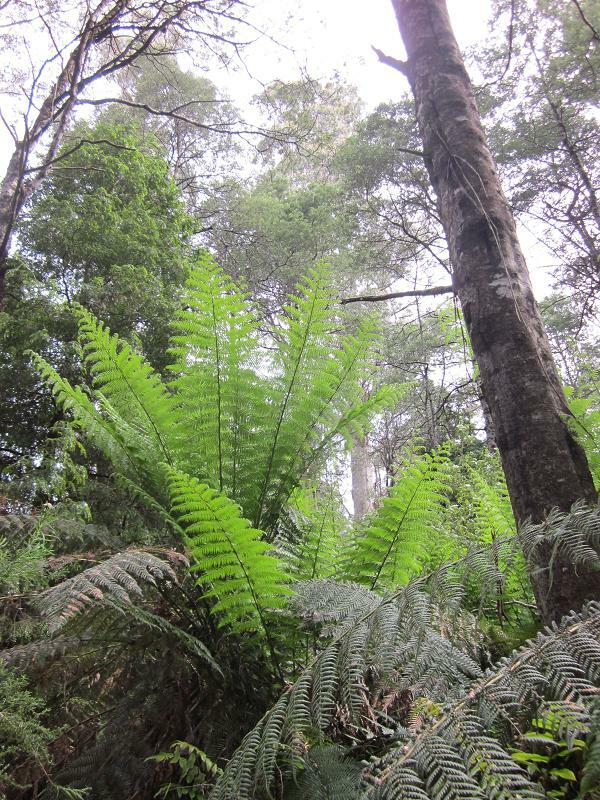 We met up in Warburton and headed into VicForests’ Central Highlands region, about 50 kilometres northeast of Melbourne. 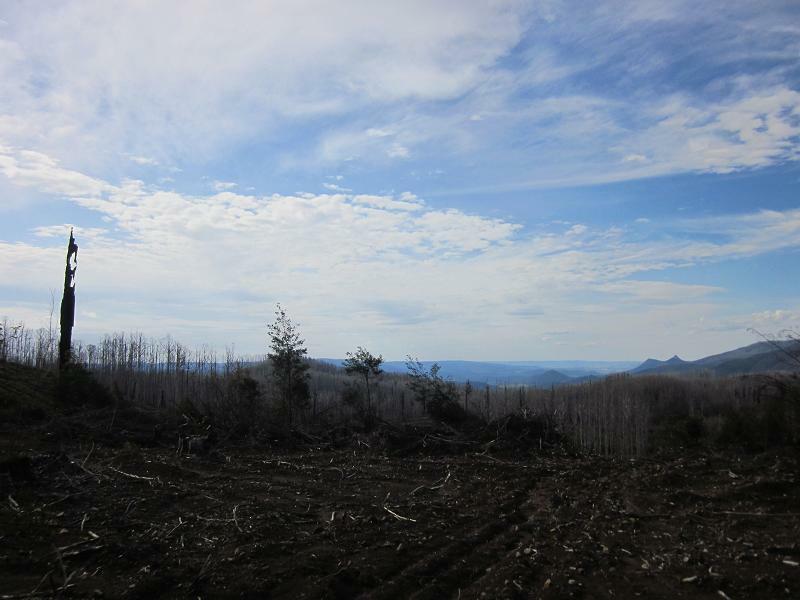 Very quickly the contrast between the fire destruction and human destruction by logging was stark. These forests are dominated by the tall Mountain and Alpine Ash. The former is Eucalyptus regnans, known to many as it is the tallest flowering plant in the world, reaching more than 100 metres in height. The burnt out areas are still confronting. Although dead Mountain Ash still tower over the landscape in many areas, life abounds in these areas demonstrating spectacular recovery. Thick canopies and dense understories are missing in many places but it is only a matter of time. You can feel life returning in these forests. The contrast with logged areas is extreme. Here I felt surrounded by death and despair. Despair because the complexity of the forest system was destroyed. We stood on hill sides raised to the bare earth by logging and the follow up burns. Erosion in parts has removed the top soil with much of it washed into Melbourne’s water catchment. Greg has a long association with these forests from his days as a campaigner with the Wilderness Society. Check out one of his recent speeches in parliament on forest protection. He and the locals shared many of their campaign stories with me, and it was fascinating to hear about the shift in local attitudes to the forests. Many people after surviving the fires are experiencing great stress from the noise and disruption of local logging operations. There have been a number of public meetings organised to discuss forest protection with hundreds in attendance. Woodchipping is ripping life and beauty out of this region. The local logging operations feed the export woodchip market and also go to the Maryvale mill in central Gippsland. While the mill owners boast that their Reflex brand of office papers are Australian made what they don’t tell their customers is that the paper is made from trees that provide home to gliders and possums and other unique Australian species. The scientists who briefed us on the tour explained that the survival of a number of the marsupials, some of which are only found in this region, is not assured due to the loss of habitat. We saw the reason for this at so many of the logging sites we visited. Most of the habitat trees these animals depend on are destroyed as part of VicForests logging operations. We were informed that the Leadbeater’s Possum, Victoria’s faunal emblem, will become extinct if this habitat destruction continues. This is a wonderful little creature. It lives high in the forests where it relies on the canopy flowers of these giant trees for food and the tree hollows for its homes. They live in colonies of often 12 animals that will then actively defend their territory which can extend for approximately 2 to 3 hectares. The Leadbeater's Possum had been presumed extinct until it was re-discovered in 1961 near Marysville in the Central Highlands. It appears this is the only place on earth it is found and the Victorian government is allowing its habitat to be trashed. The loss of this one species should be grounds alone for the federal Environment Minister Tony Burke to speak out about the need for habitat protection in this region. But not a word. Meanwhile we have VicForests boasting on their website that they use Mountain Ash to make paper. You can help counter this madness by backing the Ethical Paper Pledge. In the new year I’ll be working with Greg and the local campaigners to help end the logging of these wonderful Ash Forests. The era of destructive logging and woodchipping should be over. Governments now need a push to work on the transition of this industry to be one that works on forest protection, to safeguard such effective carbon store houses. This is the future.